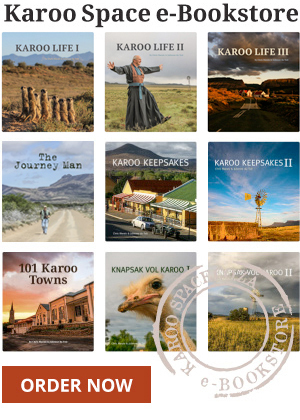 You are here: Home > Ground Zero for Karoo Fracking? Ground Zero for Karoo Fracking? A wide open Karoo plain, clear air and pure water. 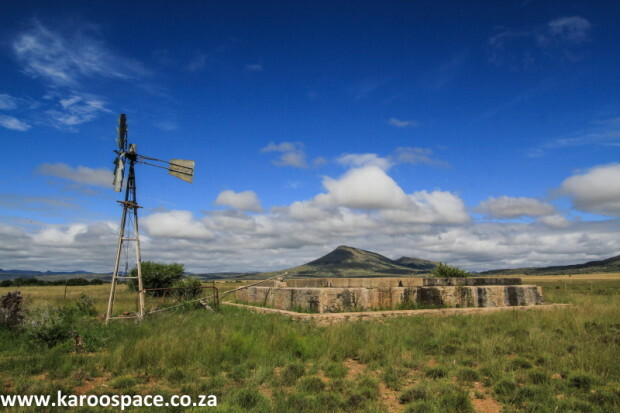 Could this be Ground Zero for shale gas exploration in South Africa? 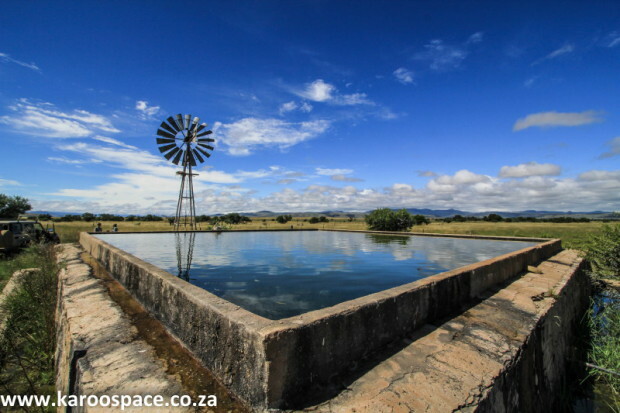 The windpump with its dam stood in the middle of a vast Karoo plain, ringed with dolerite hills and the distant N10 road. The dam on Longacre farm, a section called Groote Schuur, had been built by farmer Philip Antrobus’s grandfather in 1929. His initials were still faintly visible, etched into the concrete on one of the corners. The dam on this property had been built in 1929. The veld around the windpump and dam was full of life, covered in nodding grasses. The waterfinder bushes were in flower, pretty with their purple flowered spurs. The water’s overflow ledge attracted bees, damselflies and dragonflies and the dam water was clear as glass. We heard from Philip’s father Michael that every winter, hundreds of blue cranes gather here before pairing off in spring. But this area, north of Cradock, is circled on Shell’s map as a likely spot for shale gas exploration. Jonathan Deal of TKAG filming Wilbe Blay taking water samples. Behind them are Jan Myburgh (left) and Dr Carl Albrecht. 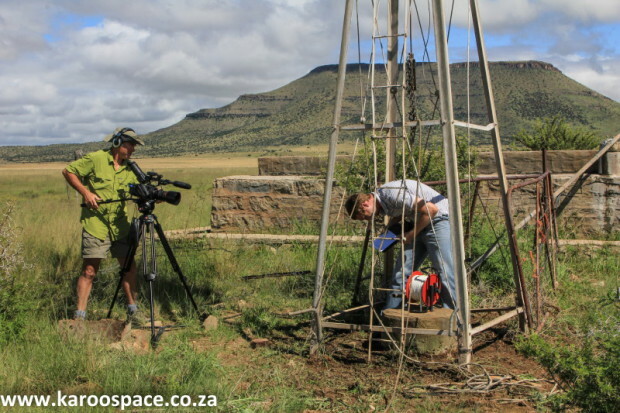 Apart from three members of Treasure the Karoo Action Group (TKAG) gathered around the windpump on 4 March, there were two journalists, one photographer, Michael and Philip Antrobus and three scientists, there to gather very important water samples from the borehole. These would be used to establish critical baseline information – just in case exploratory drilling or fracking one day polluted the aquifer’s clear sweet water. Dr Carl Albrecht, head of research for the Cancer Association of South Africa (CANSA) had initiated the project and found the funding. The geohydrologists were Wilbe Blay and Jan Myburgh of Africa Geo-Environmental Engineering and Science (AGES) in East London. Jan Myburgh is current chairman of the Eastern Cape Groundwater Division of the Geological Society of South Africa. Dr Carl Albrecht of the Cancer Association which provided the funding for the tests. They were going to be taking the water samples that would be sent to Talbot & Talbot Laboratories in Pietermaritzburg, the CSIR, and the University of Stellenbosch’s analytical laboratories. The water would be subjected to extensive testing for heavy metals, organic and inorganic substances, endocrine disruptors and other chemicals. It would be ‘fingerprinted’ by Liquid Chromatography – Mass Spectrometry (LC-MS). The testing would be comprehensive, using very sensitive equipment that can detect substances at extremely low concentrations – the equivalent of a thousandth of a nanogram, or less than a thimbleful in an Olympic-sized swimming pool. But first there were other tests to be done. 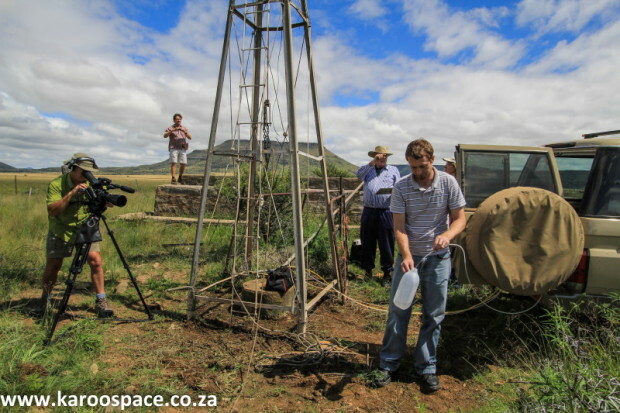 Wilbe Blay and Jan Myburgh found that the groundwater was at 10.8 metres below the surface and the borehole was 27 metres deep. Then they used an electrical conductivity logger to check how concentrated the salts in the water were. A difference in the measurements could indicate an inflow of fresh groundwater into the aquifer. Wilbe Blay taking electrical conductivity readings of the borehole, filmed by Jonathan Deal. At a level between 20 and 21 metres, electrical conductivity readings showed an anomaly, indicating a fracture in the underlying sandstone, and a connection with another aquifer. The scientists nodded. Oh yes. It was certainly possible. You can find a broad overview of CANSA’s findings on the fracking baseline water here, announced on 21 January 2015. 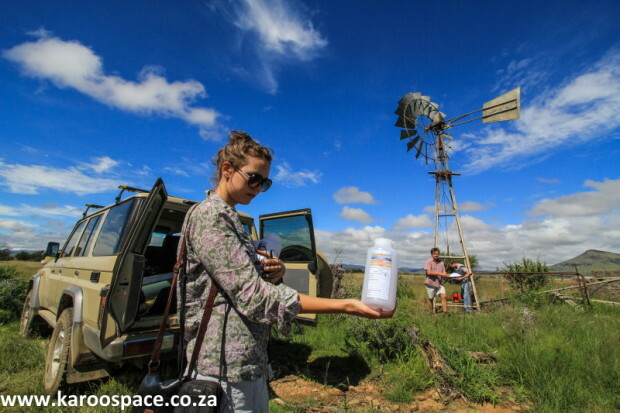 Jeanie le Roux of TKAG, with one of the water sampling bottles. 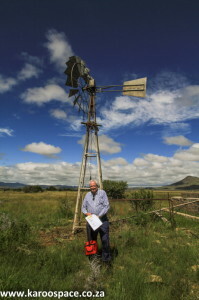 Jan Myburgh and Wilbe Blay are in the background, at the windpump. In March 2014, a team of scientists from Nelson Mandela Metropolitan University (NMMU) in Port Elizabeth started a five year study into baseline testing of natural underground systems in the Eastern Cape Karoo. The studies, funded by the University and the Eastern Cape provincial government, will include shallow and deep geophysics, risk analyses, geo-, soil- and eco-systems, seismicity and water testing. 2 Responses to Ground Zero for Karoo Fracking? Brilliant—-well done to everyone involved in this work. All polluters can now be caught and sued !!! !